The PS3 finally has its first free-roaming, Grand Theft Auto-style car-crime game, and it's... The Godfather. Again. 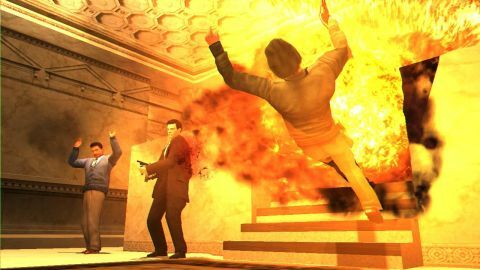 It's been a full year since the multiplatform mob drama first arrived in game form, and the appearance of The Godfather: The Don's Edition on PS3 means it's officially hit every single platform except the DS and mobile phones (although we're willing to bet The Godfather: Touch Madness and The Godfather: Horrible Mobile Edition are already in the works, somehow). Still, given that it's been a year, publisher EA knows full well it can't get away with just putting out the exact same game with updated graphics. In fact, The Don's Edition updates nearly everything except the graphics, aggressively retooling the overall experience and adding a bunch of new content while mostly leaving the visuals alone. The story and basic gameplay remain the same, though- you're still a young hood from Brooklyn, recruited into the Corleone crime family and set on a path that parallels the events of the film. You'll still run and drive around 1940s New York, battling rival mobsters, taking over businesses (most of which are fronts for illegal rackets, which you'll also have to muscle in on) and carrying out every key offscreen event from the movie. Like, say, sneaking a severed horse's head between a Hollywood producer's sheets, or taking down all of the Corleone family's biggest rivals in one climactic murder montage. It's a strange way to adapt a film, and die-hard fans might not approve of characters like Sonny and Michael being relegated to supporting roles. But the production's backed up by a compelling script and top-notch voice cast, so it works surprisingly well. Description The definitive version of the not-really-a-movie-adaptation 1940s mob drama.